I just noticed that when I click on the upvote button on posts its giving me options of voting in points. This was not the case earlier when I could just upvote with leaving a comment. I only used to get a comment box with no reputation points earlier. That's interesting. Is this part of the new version of phpBB or added through an extension? Also, how can this help on the forum here? Prevents new users from just upvoting every freaking post they find on this site, just because they feel like it. New users would have to contribute something or wait to gain any more points. Now you can only vote once in 12 hours and with 1 point per vote now (changed it now after I saw your screenshot). 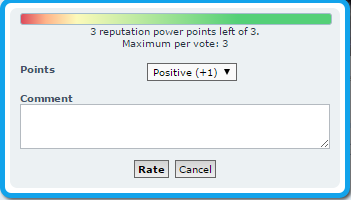 Will the voting power increase (how many points I want to give at one go) as reputation increases? No that stays constant. You can only give 1 point to every user now. I see no reason to give folks any more than a single upvote. It conveys the message you're trying to get across and stops the abuse. And yes it's an extension that allows you guys to thank the list maintainers/contributors if you so desire. I'm subject to the same rules everyone else is. I can't run around the site an upvote everyone's post either I would have to wait until I have more "power". Okay that sums it up, one last question the upvote or "reputation power points" are they deducted from the reputation? Also, no downvote system, only positive votes? If you get a warning from a moderator yes you'll lose some points. Yes no down votes as it creates animosity between the members as evidenced in another forum I belong to. Yes, keep that off as trolls and haters would love to abuse that too. I have seen that abused on another forum I used to visit. No need to give them another weapon to spread their hatred.